The Queen’s 60th Jubilee overtook the UK last weekend. Our street had a party, much silliness and fun were had. I baked a cake. There were plenty of Union Jack cakes made with strawberries, blueberries and cream, and one made with carefully arranged M&M’s. I’d like to claim I’d decided not to go for anything so contrived, but the reality was I couldn’t be bothered to go shopping on a Bank Holiday weekend. 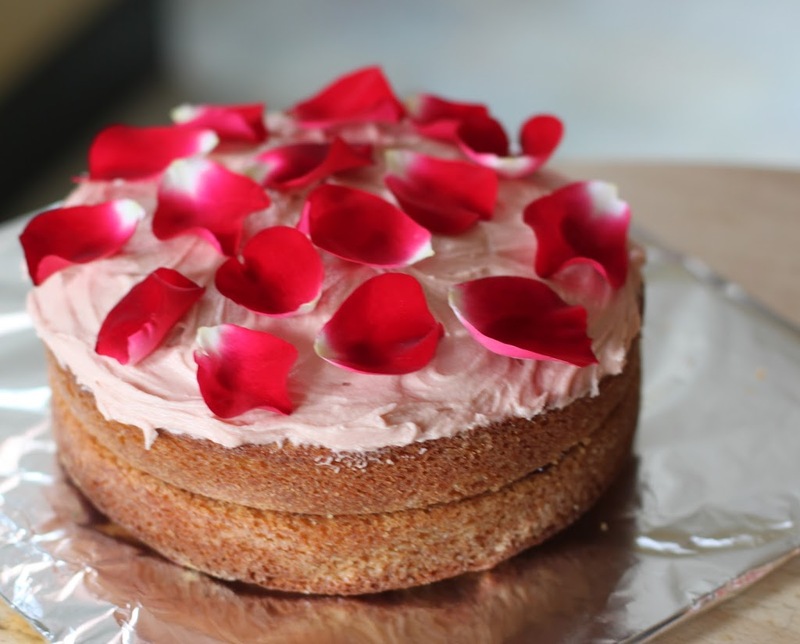 I’m claiming this as an English Rose cake, but I’m sure you could call it a Canadian Rose, or Irish Rose, or ‘whatever nation you happen to be in that has edible roses’ Rose cake if you needed to adapt it for your celebration. It’s a standard Victoria Sponge recipe, that, I think is White Cake, or Yellow Cake to folks outside the Commonwealth. I sandwiched it with raspberry jam, but feel free to go wild with cream. I didn’t because I knew it would sit out for an hour in the sun. I used a buttercream icing with a scant teaspoon of rosewater and a single drip of red food colouring, it’s easy to go overboard with either and spoil the effect so add less than you think because you can always add more. You can be a bit more generous with the buttercream and add it to the sides too, but I was going for a more minimalist look. I topped it with rose petals from the garden. Choose flowers that aren’t quite fully bloomed. Pull each petal really gently. Check for greenfly or other creatures. Rinse them very gently and air dry, don’t squish them. I had to carry it down the street in English summer weather – think Gale Force 6 – so I pressed the petals down firmly into the icing to keep them in place, if I was just serving it at home I’d just scatter them on.